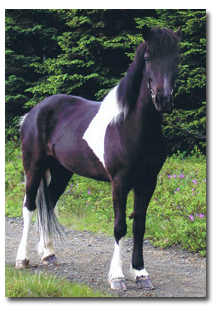 Gima is a first prize black pinto mare. She is excels as both a riding and breeding horse. Gima has so many incredible attributes it’s hard to even know where to begin! Gima’s bloodlines are nothing short of Icelandic royalty. Her sire, first prize Stígur frá Kjartansstöðum, is a honor prize stallion and comes from a line of honor prize stallions (S: Náttfari frá Ytra-Dalsgerði, SS: Sörli frá Sauðárkróki) that are well known for producing many of Iceland’s most exceptional riding and breeding horses. 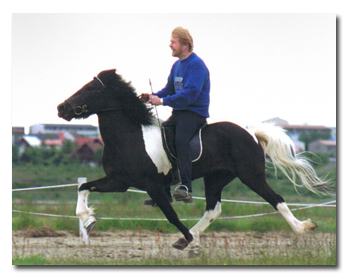 In addition, Stígur’s dam, Terna frá Kirkjubæ, has proved to be a legendary mare in Icelandic horse breeding. The bloodlines of Gima’s dam, Gígja frá Ytra-Dalsgerði, are no less impressive. Gígja was never evaluated for ridden abilities, but she received a first prize score for conformation of 8.13. She has also proved her value well as a breeding horse as all her evaluated offspring are first prize. Gígja’s sire is the great first prize and honor prize stallion Kjarval frá Sauðárkróki. Gígja’s dam is the first prize mare Skeifa frá Ytra-Dalsgerð, who must have been an extremely talented mare as most did not even bother to have mares evaluated back in those days. All these impressive bloodlines come together in Gima to give her incredible genetic strength. Gima’s ridden abilities are no less impressive. 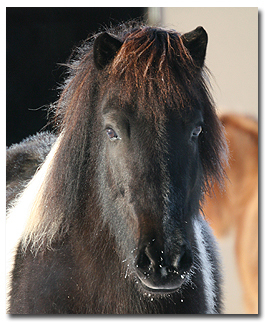 She is a true five gaited horse with a soft, supple tolt and impressive fast flying pace. Like all of our breeding horses Gima’s tolt is a natural clear four beat and she requires no special shoeing or other enhancements. She is capable of tolt in all speeds. 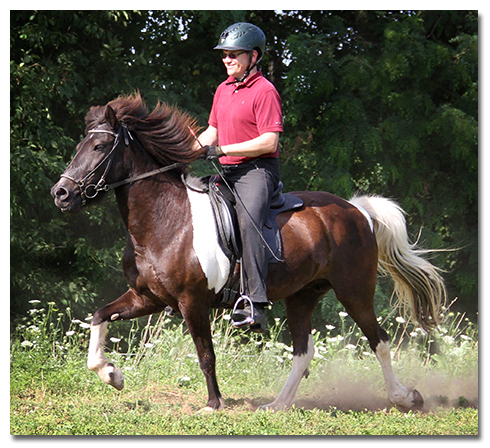 Her trot and canter are also easily accessible to the rider and clear in cadence. And to top it all off she has secure and fast true flying pace! She is spirited but easy to control and enjoys work in on the track, in the ring or going on trail rides. Gima is well schooled and a joy to ride. Her great talents and strengths aside, Gima is an exceptionally sweet horse that is a pleasure to have around. She is easy to do anything with and confident and self-assured out on the trail. We have used her primarily as a pleasure riding and breeding horse - but she can also be successfully shown. She has recently (2015) been successfully ridden in sanctioned sport competitions by youth riders. Her natural clear beat in tolt and easy, safe flying pace have made her the perfect horse to try five gait or pace events. Her super smooth gaits and level head also make her a Beer Tolt queen! She is the kind of horse that you can take to a show - and the next day go for a nice relaxed trail ride. Because of all this she is our #1 lesson horse. We are proud to have her as part of our herd. To view more photos of Gima, please visit her photo album. We are proud to announce that three of Gima’s offspring – Loftsteinn, Kleópatra, and Sokkadís - were in the top five highest evaluated young horses of 2013 out of approximately 60 horses – with Loftsteinn and Kleópatra holding spots 1 and 2! This is excellent proof of what a terrific breeding mare like Gima can produce. We plan on riding Gima in 2018, however, she may be available for breeding lease. For more information on Gima please contact us.